I don’t do self-help books but when I find my will-power has sunk to an all-time low, my weight risen to an all-time high, and that the self-help book which landed on my doormat was written for people who like to drink alcohol (too) frequently and written by a dear friend and AWE member into the bargain, it’s time to put aside my prejudices. The friend in question is, fittingly, infuriatingly, the picture of gorgeous good health – slim, toned, bright-eyed and shiny-haired. She works as a wine guide in Bordeaux and travels the world as a wine educator. 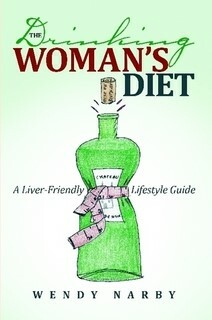 Her name is Wendy Narby and her book is The Drinking Woman’s Diet, A Liver-Friendly Lifestyle Guide. This is a book written with women like me in mind, who work in the wine trade and are exposed to far too many multi-course dinners, daily wine tastings and who spend much of their time in between sitting at their desk. It is equally suitable for women who do that wine o’clock thing, for women who find they’ve become Prosecco junkies, for women who have developed a (regular) taste for wine, gin, whisky, beer, cocktails and sake. It’s also perfect for men. Easy to read, there is no pious, sanctimonious preaching going on. Despite her unfathomable ability to say no to a bread roll, Wendy understands that the steps to a healthy life may not be a piece of cake for all of us. She makes it feel like it is definitely doable, hand-holding the reader as she drip feeds extra useful tips with each chapter. There are some obvious hints to a healthy lifestyle which we should all know by now such as having a couple of alcohol free days a week and drinking plenty of water but there are many that are new to me and which, according to Wendy, should be easy to implement into my life. Well-researched, informative as well as entertaining, The DWD is divided into 7 chapters, one entitled How to Drink Like a French Woman (Chapter 4 in case you want to flick straight to it), and then into bitesize chunks so you can dip in and out, each section finishes with the key principles relating to that chapter. These KISS principles are what will inspire you and keep you going as they’re easy to remember and don’t seem too onerous to achieve. There’s a chapter on yoga as Wendy’s a firm believer in its health benefits for both mind and body (she’s planning on becoming a certified yogi), and even one on wine tasting. Knowing her love of chocolate, I’m surprised there aren’t pages devoted to its healing powers – too much to hope for. I know I should cut out bread and other carbs. I know I need to reduce my weekly alcohol intake. I know I should drink more water. With this book by my bedside, I might just be able to kick-start a healthier lifestyle. This week, I’ve booked into my first yoga class and borne two alcohol free days. One step at a time, right? I’m learning to love my liver (chapter 3)……before it’s too late. I can’t recommend the Drinking Woman’s Diet highly enough for anyone who needs to make healthy changes for a more balanced life but still wants to drink wine. And, in my case, do my job. Available to buy through Amazon or contact Wendy if you are an AWE member. How do I go about buying a couple of copies as an AWE member? For delivery in UK. Best of luck with this and I much look forward to reading it.